Subscriber and view counts updated as of 7 January 2019. 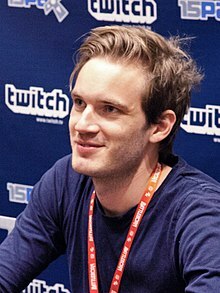 Felix Arvid Ulf Kjellberg (born 24 October 1989 in Gothenburg), better known by his online nickname PewDiePie, is a Swedish video game commentator on YouTube. He mainly does Let's Play videos, in which he plays a video game and talks about it. He has over 93 million subscribers. On 15 August 2013, his channel became the most subscribed channel on YouTube. He was also the first YouTuber to get 14 million subscribers. Before starting his own YouTube channel, PewDiePie studied Industrial Economics and Technology Management at Chalmers University of Technology until he dropped out. Disapproving of his decision, his parents cut off his support. He made a living by selling hot dogs until his channel got enough subscribers for him to make a living off of the channel. PewDiePie was born in Gothenburg, Sweden. He lives in England with his girlfriend, Marzia Bisognin, who is also a YouTuber. Pewdiepie was the first ever channel to have 50 million subscribers. PewDiePie is attempting to break the like record on YouTube. Recently, PewDiePie aka Pewds has been creating silly, fun videos such as " Meme Review " " You Laugh You Lose ( YLYL)" " Pew News" and " LWIAY". Recently, a YouTube Channel named T-Series is now trying to get more subscribers than PewDiePie. ↑ PewDiePie received a second Silver Play Button for the Jack septiceye2 channel in 2016. ↑ PewDiePie received a second Gold Play Button for the Jack septiceye2 channel in 2016. ↑ Wadeson, Danny (6 September 2013). "Gamertube: PewDiePie and the YouTube Commentary Revolution". Polygon. Archived from the original on 27 June 2015. Retrieved 22 June 2015. ↑ 2.0 2.1 PewDiePie (24 November 2016). I WAITED 4 YEARS FOR THIS!!!!. PewDiePie. YouTube. Archived from the original on 25 November 2016. Retrieved 26 November 2016. ↑ PewDiePie (11 June 2016). THE DIAMOND PLAYBUTTON (Part 3). PewDiePie. YouTube. Archived from the original on 12 June 2016. Retrieved 11 June 2016. ↑ Cohen, Joshua (19 December 2016). "YouTube Sends PewDiePie Custom Ruby Play Button To Commemorate 50 Million Subscribers". Tubefilter. Retrieved 1 August 2018. ↑ "PewDiePie". YouTube. Retrieved 12 September 2016. ↑ Joshua Cohen (15 August 2013). "It's Official: PewDiePie Becomes The Most Subscribed Channel On YouTube". Tubefilter. Retrieved 16 August 2013. This page was last changed on 24 April 2019, at 13:19.